These are the hairy potatoes you may have seen in the vegetable section. It has a neutral taste and therefore usually cooked in dashi with some soy sauce. However, what makes this potato quite different from the other root vegetables is its slimy texture. Among other slimy textured food - like okra, natto, mozuku seaweed, the Japanese are fond of this satoimo, as we think that the sliminess has some health benefits. 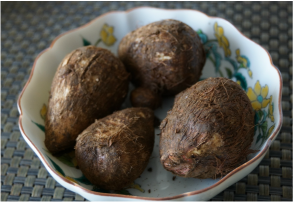 Satoimo is high in fiber, containing vitamin C and the vitamin B Group, making it nutritious but low in calories. 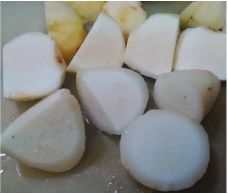 The main component - starch is gelatinized when it's heated making it easy to digest.It also contains more potassium than any other potatoes which is effective in lowering blood pressure. If you cut it, you will notice that it is cooked just on the outside. Remove from heat and place the satoimo in a bowl of ice water until it is no longer hot. Cook according to the instructions. Peel the skin off the satoimo as directed above and cut it into bite size pieces. Heat a Tablespoon each of sugar, mirin, and soy sauce in a pan and bring to boil. Add the satoimo and roll it in the sauce until it is fully covered. Garnish with chopped green onions an serve immediately.